Quiche is a savoury, open-faced pastry crust with a filling of savoury custard with cheese, meat, seafood, or vegetables. Quiche can be served hot or cold. 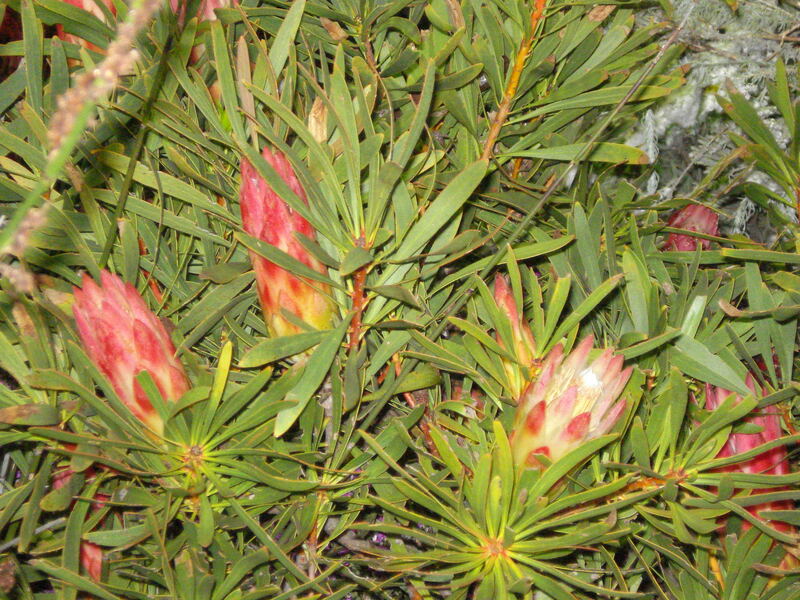 It is part of French cuisine, but is also popular in South Africa. I have made it without the crust. · 1 medium onion, diced. · 2 or 3 cloves of garlic, minced or pressed. -Mix the flour and the salt together in a medium bowl. -Cut the butter into the flour and salt mixture . Drizzle the ice water over the top of the dough and mix. -Preheat the oven to 180 degrees C.
-Heat the olive oil and butter over medium heat until the butter is melted and bubbly. -Sweat the onion, garlic, mushrooms and bacon in the olive oil and butter mixture until the onions are translucent ..
-Add the spinach to this mixture and continue cooking until the spinach is heated through. Remove from the heat. 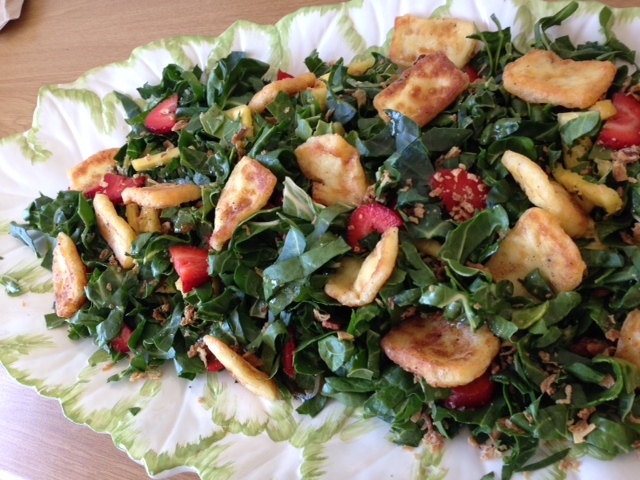 -Cut the feta into the spinach mixture and mix together. Set aside to cool. -Place the rolled out dough in the tin, place the spinach mixture in the dough. -Beat together the eggs and cream. Add fresh ground pepper and a pinch of salt (you won’t need too much salt, as the feta is rather salty). Pour this mixture over the spinach/feta mix in the pie shell. Grate some cheese over it. -Bake for about 45-60 minutes, or until a lovely brown on top and the eggs have set . 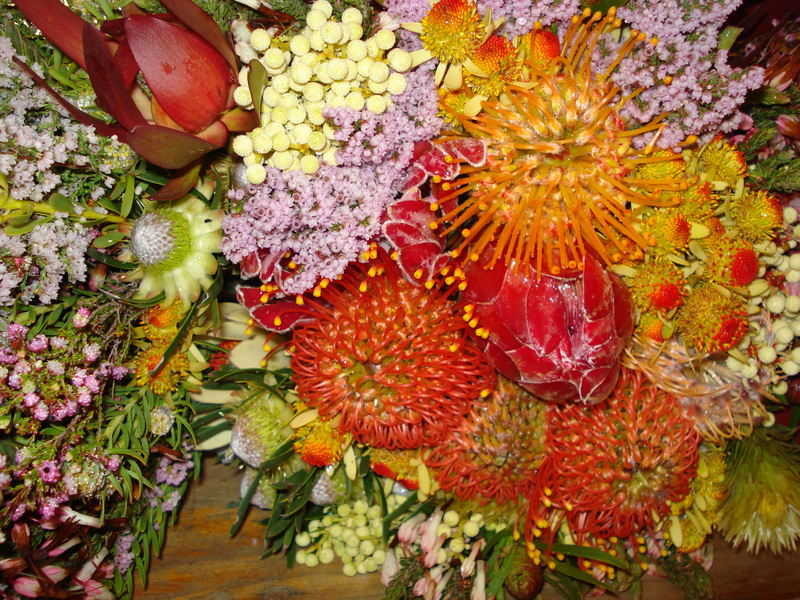 Heritage Day (Afrikaans: Erfenisdag) is a South African public holiday celebrated on 24 September. On this day, South Africans across the spectrum are encouraged to celebrate their culture and the diversity of their beliefs and traditions, in the wider context of a nation that belongs to all its people. 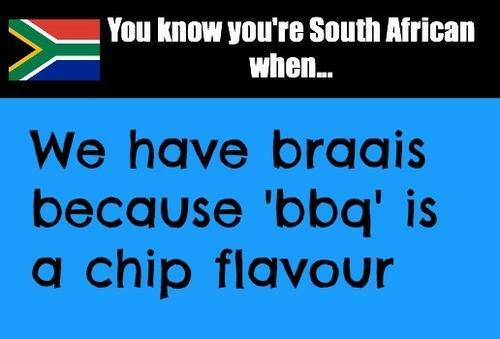 In 2005, a media campaign sought to “re-brand” the holiday as National Braai Day, in recognition of the South African culinary tradition of holding informal backyard barbecues, or braais. We also had a braai. 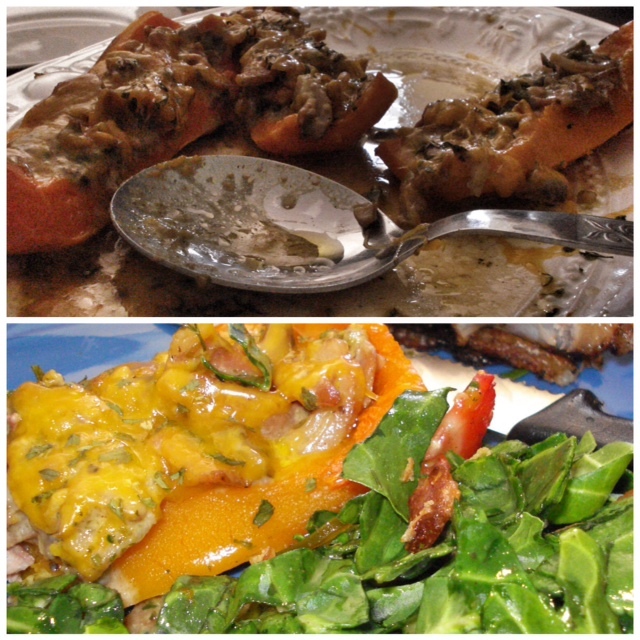 I made a butternut dish my mom used to make years ago. With that we had lamb chops and boerewors. 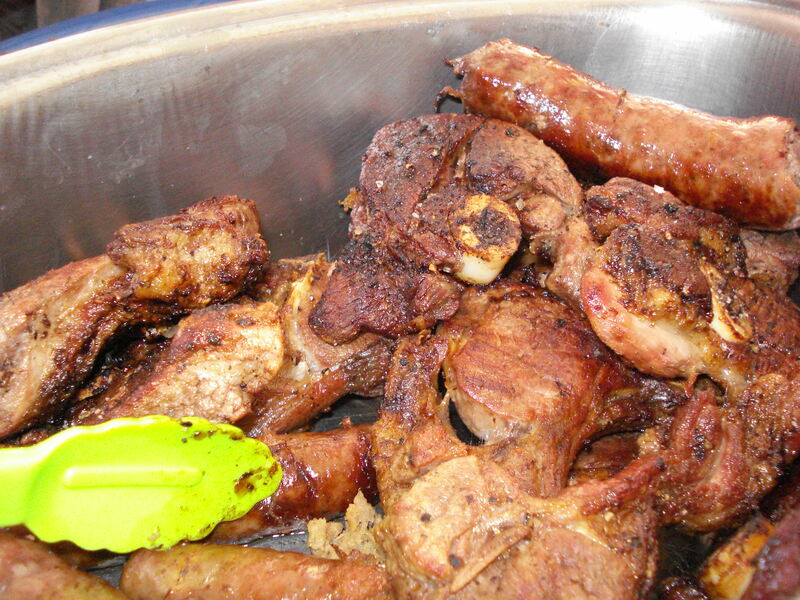 (Boerewors is a type of sausage, popular in South African cuisine. The name comes from the Afrikaans words boer (“farmer”) and wors(“sausage”), and is pronounced [ˈbuːrəvors], with a trilled /r/.Boerewors must contain at least 90 percent meat – always containing beef, as well as lamb or pork or a mixture of lamb and pork, the other 10% is made up of spices and other ingredients. Not more than 30% of the meat content may be fat. Boerewors may not contain any “mechanically recovered” meat, this is meat derived through a process where meat and bone are mechanically separated. Place butternut squash halves on a large baking sheet flesh side up. Place 1 teaspoon butter in the middle of each squash. Season with salt. Roast 25 minutes, until flesh is fork-tender. Fry onion, green pepper and garlic in some butter. Add the mushrooms and bacon to the onion and fry until cooked. Add the cream and let it it reduce for a while. 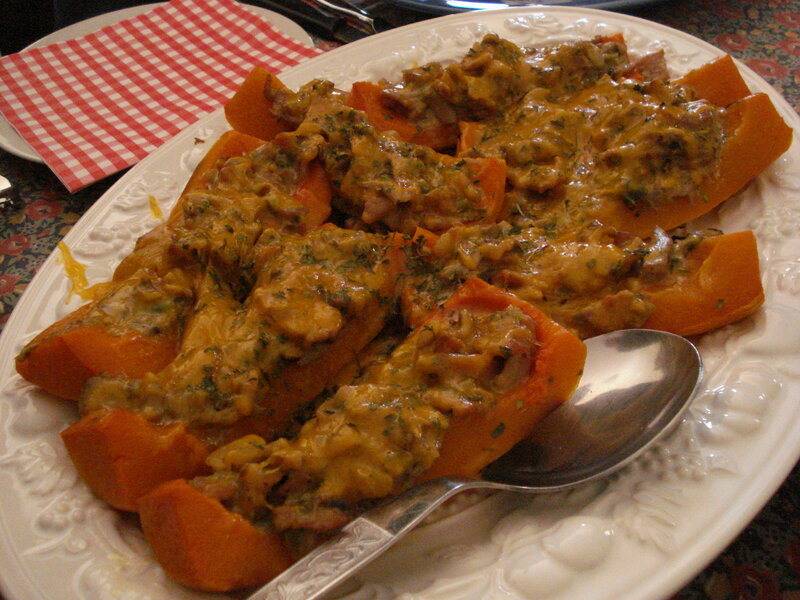 Cut the butternut halves lengthwise , spoon mixture onto the butternut, grate some cheddar cheese over it. Sprinkle with chopped parsley and bake for about 10 minutes. 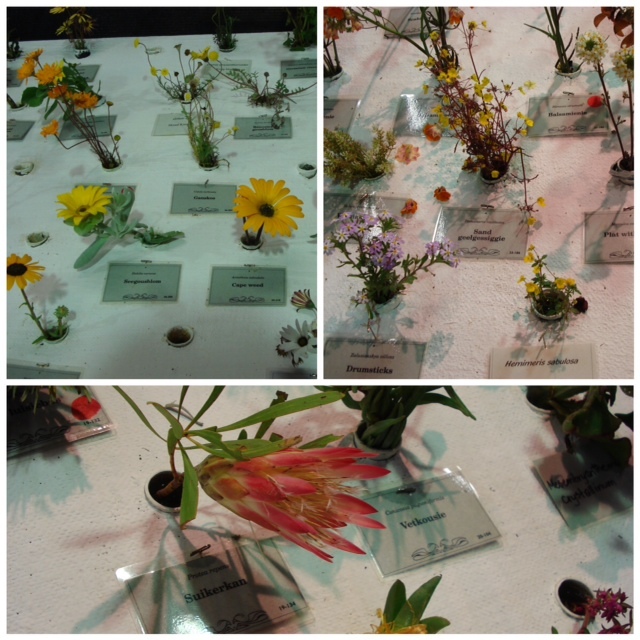 Labelled species at the Darling Wild Flower show. 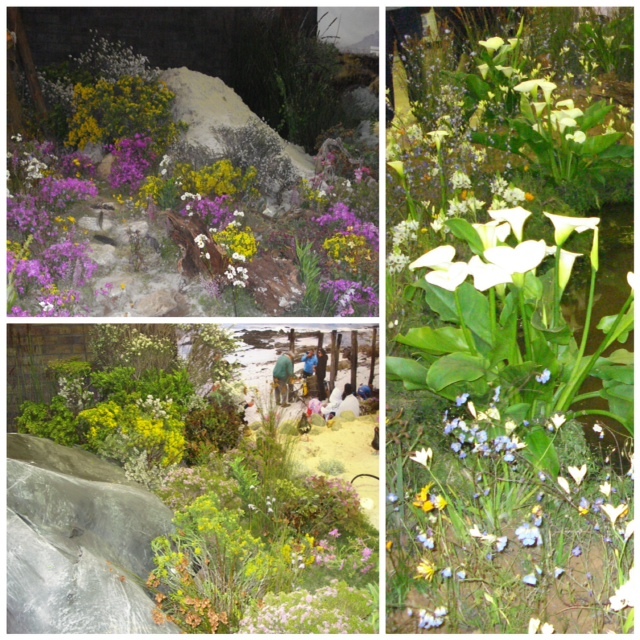 Although it was a rainy day the atmosphere at this show was vibrant and we had a wonderful time there. 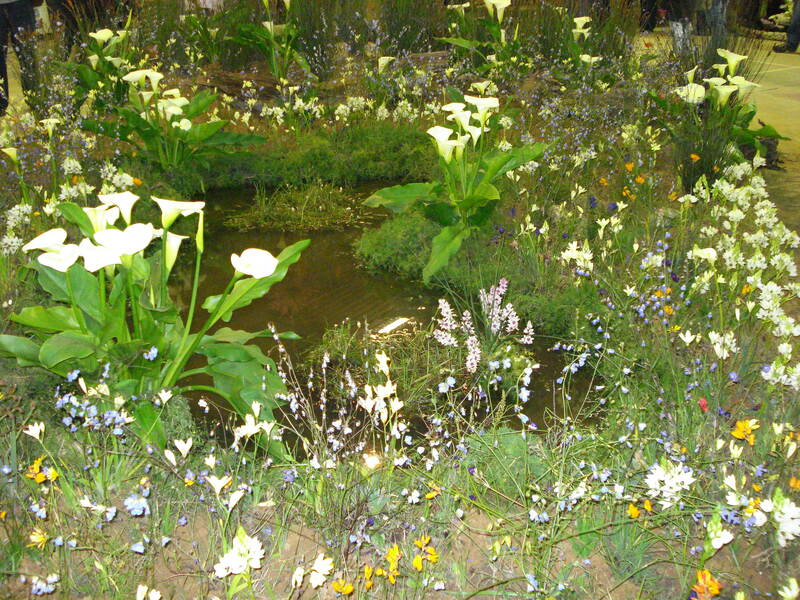 The hall was landscaped with Darling wildflowers, from the most fragile and rare to the ones easily found. 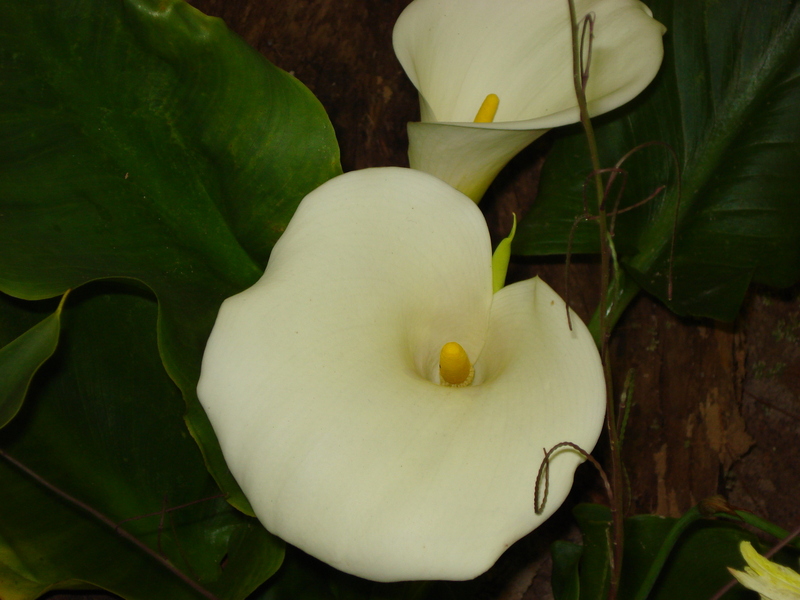 And Arum lilies (my favourite) in abundance! I have been making this easy Vanilla butter cake since my childhood which my mom taught me to make. Heat the oven to 180 degrees C. Lightly coat an 8-inch cake pan with butter and dust with all-purpose flour. Sift the cake flour, baking powder, and salt into a large mixing bowl. Beat eggs and sugar till light and fluffy. Add the vanilla beat on medium-high, just until blended. Add the dry ingredients to this mixture. Mix well. Bring butter and milk to the boil and add it the the mixture. Mix well. Pour into the prepared pans and bake until a wooden skewer inserted in the center comes out clean — 25 to 30 minutes. Cool cake in the pan on a wire rack for 5 minutes. Unmould and cool completely. Ice with any icing you like. This is a Jamie Oliver recipe! I saw how he made this on a TV-programme and found the recipe on the internet. 1 Heat the oil in a pan and fry the spices for a few minutes. 2 Add the butter, then the potatoes, making sure they are completely coated in the spicy mixture. 3 Cook for about 10-15 mins, then stir in the tomatoes and the coriander. However, this is my version of his recipe. 1 Heat the oil and butter in a pan and fry the onions and garlic, add the spices and fry for a few minutes. 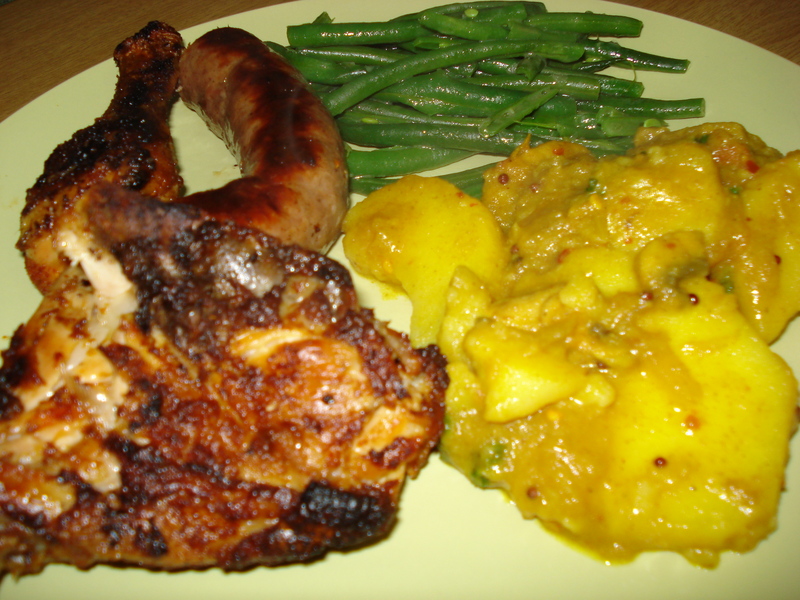 I served this lovely spicy side dish with roasted chicken, boerewors, green beans and a tossed salad. 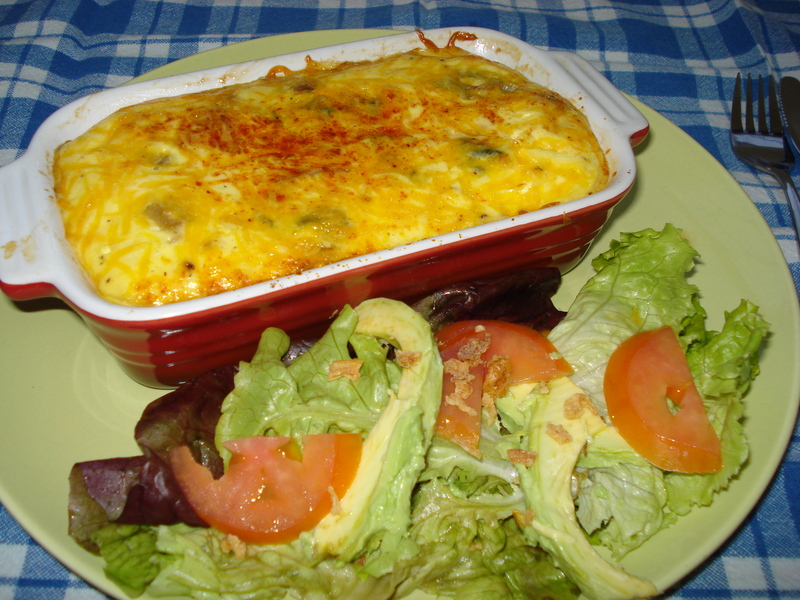 Bobotie is a South African dish consisting of spiced minced meat baked with an egg-based topping. Bobotok was an Indonesian dish consisting of meat with a custard topping that was cooked in a pan of water until the egg mixture set. Colonists from the Dutch East India Company colonies in Batavia probably introduced bobotie to South Africa.The first recipe for bobotie appeared in a Dutch cookbook in 1609. Afterwards, it was taken to South Africa and adopted by the Cape Malay community. It is also made with curry powder leaving it with a slight “tang”. Although not particularly spicy, the dish incorporates a variety of flavours that can add complexity. For example, the dried fruit (usually apricots and raisins/sultanas) contrasts the curry flavouring very nicely. The texture of the dish is also complex, with the baked egg mixture topping complementing the milk-soaked bread which adds moisture to the dish. Preheat oven 180 degrees C. Lightly grease a baking dish. Soak the bread in the milk. Heat the oil and butter in a large skillet over medium-high heat. Cook the onions and garlic oil until soft. Add the curry powder and apricot jam to the onions and mix well. Then add the chutney, vinegar,lemon juice, Worcester sauce and half of the Turmeric to the mixture. Mix well. Squeeze the excess milk from the bread. Set the milk aside. Add the bread to the onion mixture. Stir in the raisins, salt, almond and minced meat. Mix well and cook over low heat until meat changes colour. Take off the heat and add 1 beaten egg into the meat mixture en stir well. Pour the mixture into the prepared baking dish. 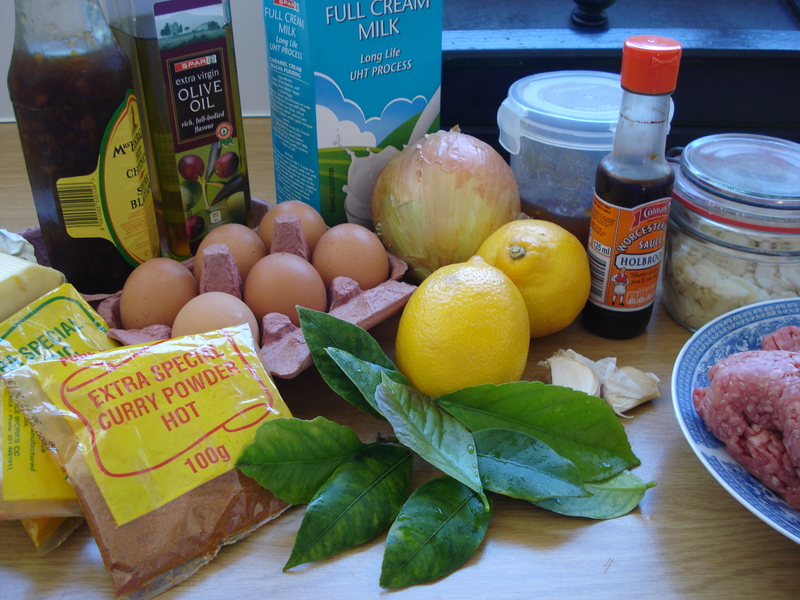 Lay the bay- or the lemon leaves onto the top of the mixture. Whisk together the reserved milk, egg, and other half of the Turmeric. Pour over top of the dish. 6. Place the dish in an oven pan, pour water into the oven dish about two thirds full. Bake in the preheated oven 1 hour. Any granny square begins with a small loop of chain stitches. Basic granny squares alternate sets of double stitches and chain stitches. 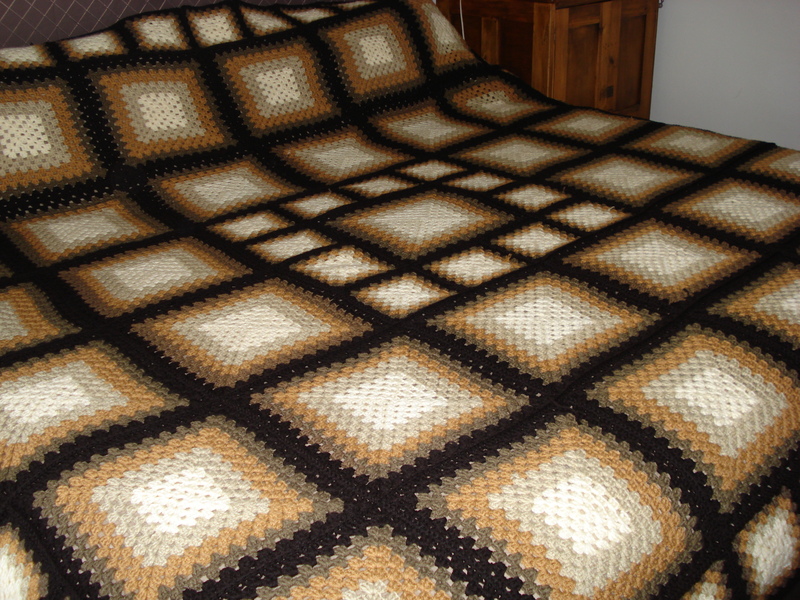 Variant patterns use different stitch types or produce other geometric shapes such as hexagons. In order to achieve a distinct angle at the corners the designer uses extra chain stitches. Subsequent rounds are added by wrapping multiple stitches around the existing chain stitches. Hundreds of variant motifs are in use and entire books have been devoted to granny square designs. Last year my sister-in-law challenged me to crochet a blanket for our grandson, while she was doing one for our granddaughter, but I have not done any crochet work in years!! 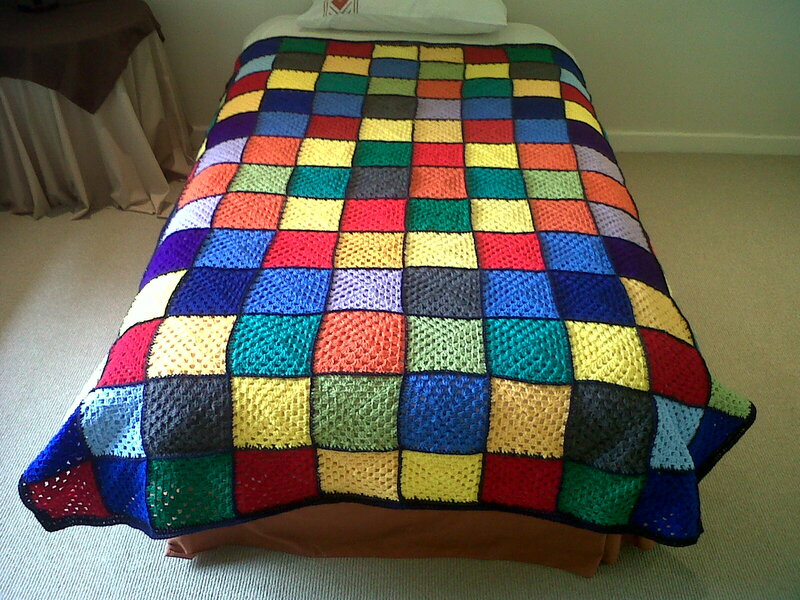 Frantically I searched for ideas to make a granny-square blanket for a little boy. I came up with this “design” for his “rainbow” blankie. While I was doing this blanket my friends and sisters pitched in and helped crocheting a few blocks. 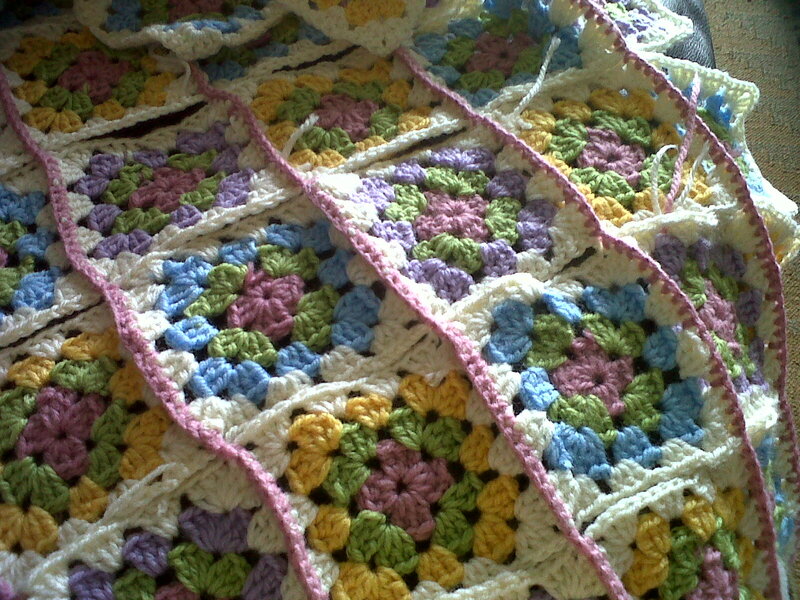 After completing it , I helped my sister-in-law to put this beautiful girly blanket together for our granddaughter. These two blankies had to be vacuum packed to fit in a suitcase all the way to New Zealand. By then I knew that I was “hooked” and started to buy wool for the big one I wanted to make for our king-sized bed. Although I had the wool I only started with the new blanket during the month of July this year. I have changed the design a few times, which resulted in a lot of extra squares in all different patterns which will have to become my next project! 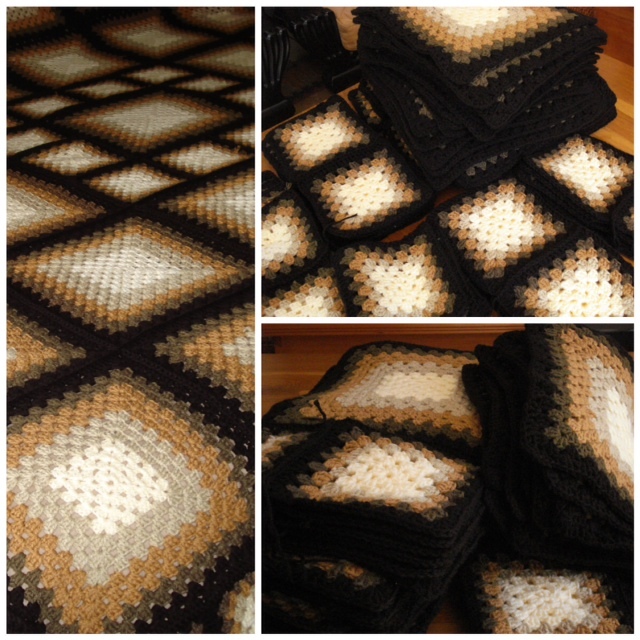 I have finished this blanket today.